The U.S. Naval Sea Cadet Corps of Escondido Welcomes You! 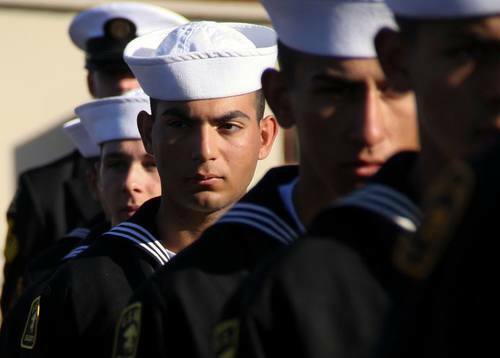 The U. S. Naval Sea Cadet Corps offers young Americans ages 10-17 a wealth of opportunities. Cadets learn leadership, management, organization and discipline while developing honor, courage, and commitment. The U.S. Naval Sea Cadet Corps helps fulfill that goal by providing critical mentorship, training, and leadership opportunities to young people enabling them to reach their fullest potential. But if you were to ask our cadets why they joined they would simply tell you that it's fun! What is the Sea Cadet Corps? Honor, Courage, Commitment is the Navy’s motto and adult volunteers strive to teach these ideals to their cadets. Cadets meet or "drill" at their local unit weekly or monthly throughout the year. A unit is structured along military lines and is headed by a Commanding Officer. Each unit offers basic instruction on military drill and discipline, is strongly involved in community service, and encourages physical fitness and academic achievement. Additionally, some units offer specialized trainings in robotics, marksmanship, color and honor guard and cyber security. Membership in the Sea Cadet Corps offers unique access to facilities, installations and events far beyond what most youth programs offer with units touring Navy, Coast Guard and Marine bases, nuclear-powered aircraft carriers, submarines, helicopters, hovercraft and and even top-secret dolphin training facilities. Special events include Blue Angel flight practice and other air shows. Guest speakers range from active duty SEALs to fighter pilots. In total, the Sea Cadet Corps strives to teach leadership, foster team work, provide unique access and opportunities, encourage excellence in moral and physical standards and develop an understanding of the military command structure. During summer and winter school breaks, Cadets may participate in advanced trainings that are offered nationwide and overseas. These include: Field and Basic Medical, Leadership, Field Ops, Aviation, Land Navigation, Master-at-arms, Marksmanship, Music, Seamanship, Sailing, Photojournalism, Culinary Arts, and even SEAL Training to name just a few. Select cadets are eligible for international exchange programs. For those interested in furthering their education, there are internships at Naval or the Coast Guard Academies available. The Naval Sea Cadet Corps also offers several college scholarships. Take a moment to check out the other pages of this website to see the exciting things that Escondido Battalion and Training Ship Kit Carson is up to. If you are interested in attending an information session to learn more, contact us via the How to Join link above. A staff member will contact you to answer any questions you may have and let you know when and where our next information session will be held. After that, you have the option to join the unit for a day before making a commitment. We look forward to meeting you! Our Welcome Aboard Handbook for New Recruits can answer many of your basic questions about the Naval Sea Cadet program. Click the button below to access it.